This "Historically Speaking" column appeared in the Exeter News-Letter on Friday, September 15, 2017. In 1839, a young lawyer named Abraham Lincoln waited patiently in a receiving line to meet the pretty and eligible Mary Todd. “Miss Todd,” he blurted out, “I want to dance with you in the worst way.” Mary would later reflect that he then did just that. Coming from a poor and somewhat neglected childhood, Lincoln had never cultivated the ability to dance. Mary, on the other hand, was well schooled in the art. Social dancing was considered a necessary skill. Mary Todd Lincoln hailed from the South. But what of New England – were we dancers in the early years of our town’s history? In a region settled largely by Puritans, a group that forbid wedding rings as a form of vanity, it might be surprising to learn that they were somewhat tolerant of dancing. The Puritans believed that love of God superseded love of any other thing, be it people or activities. Dancing, which was in the Bible, could be harmless if one was careful to avoid adulterous temptation. Mixed dancing, men and women dancing together, or clearly pagan dancing, such as the springtime Maypole dancing, were sinful. But perhaps a simple barn dance wasn’t so dangerous. 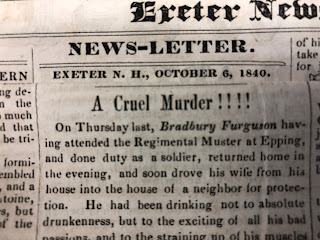 We don’t have evidence of Exeter’s dance history in the 17th century to either confirm or deny what was going on, but by the late 18th century, dances were occurring almost weekly in town. Patty Rogers, the daughter of local minister Daniel Rogers, noted in her diary that ‘assemblies’ were held on Thursday nights in town. In Marilyn Easton’s Passionate Spinster, The Diary of Patty Rogers: 1785, she noted that local inns, “hosted formal dances on Thursday nights with lively music and plentiful alcoholic spirits. Patty loved to attend Thursday Assemblies and was often ‘unwell’ the morning after.” Dances were taught by itinerant dancing masters who kept everyone up to date on the current steps. Easton’s work also mentions Phillips Exeter Academy student, Leaverett Saltonstall, who noted in his 1796 diary the names of at least seven different dances with colorful names like ‘York Twister,’ ‘Shady Groves’ and ‘Maid of the Pump Room.’ Try not to let your imagination get away with you; most of these dances had minimal physical contact. 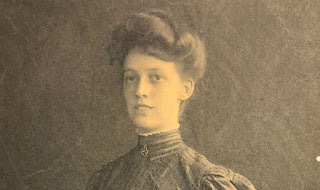 A generation after Patty’s time, Elizabeth Dow Leonard attended dances in Exeter, but remembered them for their uptight propriety. “Even promiscuous dancing was tabooed at our country balls, as bringing in too much in contact with the canaille (common folk) who had not attended dancing school at least one quarter. We danced, but it was only with our set, for no Hindu castes were ever kept more inviolately intact in their amusements than were ours, and we gave up fun and looked after the shadows of our own dignity instead.” Dances included the popular Quadrille, a square dance for four couples with many variants, and line dances. In the 1820s, the scandalous waltz arrived in America. Dancers whirled around pressed together in couples. Priggish Exeter embraced the new dance style with caution. 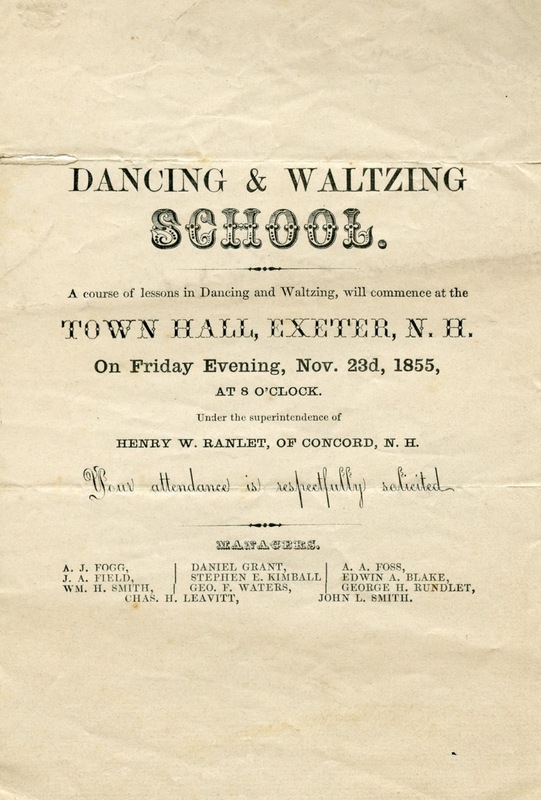 It is of some note that dancing master Henry W. Ranlet, of Concord, N.H., advertised his class as “Dancing and Waltzing” in 1855, as if the waltz was not quite ‘dancing’ as New Englanders might define it. Waltzing, and its counterpart the Polka, brought couples together and eliminated the need for large group participation. By the time the Robinson Female Seminary began holding its annual Senior Receptions in the late 1800s; both the polka and waltz had become part of the program. Participants would be given a dance card upon arrival – often with a tiny pencil attached by a cord – onto which one would jot down the partners for each dance. There are dozens of dance cards in the collections of the Exeter Historical Society. Some are entirely filled by enthusiastic dancers, others are sadly empty. The Seminary girls included a few waltzes and polkas into their program, being careful to separate them with group dances – quadrilles, lanciers and the Portland Fancy (a swing version of which you can see Judy Garland and Gene Kelly mash up in Summer Stock) – perhaps to allow a bit of contact, but not too much. In 1919, the Exeter Hook and Ladder Company Ball at the Town Hall featured such classics as the Virginia Reel and added the Fox Trot and several rounds of Schottische, a Bohemian folk dance that reflected the town’s new immigrant population. The dance card from this event lists 8 different types of dance with a stunning (and exhausting) 20 rounds. Participants must have been exhausted by the end of the evening. But considering the early opposition by New England Puritans like Increase Mather, who published a treatise called An Arrow Against Profane and Promiscuous Dancing Drawn out of the Quiver of the Scriptures, in 1684, dancing had clearly caught on in Exeter. Images: Dancing in 19th Century Exeter took careful practice and study. The first image: A few of the many dance cards in the Exeter Historical Society's collections. 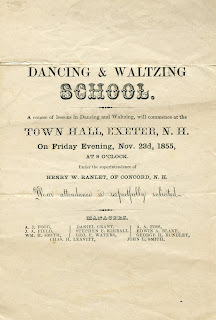 The second image: This 1855 handbill advertised the dancing school of Henry W. Ranlet of Concord, N.H. His classes were sponsored by local men. A ball could be a complete failure if the participants didn’t know the steps.